It’s probably best to establish, right up front, my engagement with Mike Mignola’s character, Hellboy. I never read the comics, so my only knowledge of the character comes from the two films made by Guillermo Del Toro in 2004 and 2008. I understand that Mignola was happy with them, but I have no idea whether those films or this one cleave closer to his work. Nor do I especially care. A film adaptation is a work distinct from a comic or a book, it has to stand on its own feet and work on its own merits. 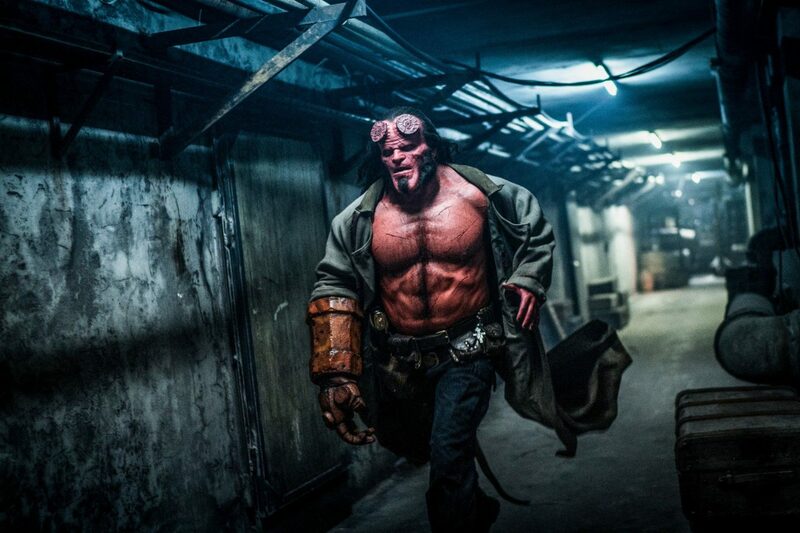 On those terms, Neil Marshall’s Hellboy is a dismal failure. The basic story finds Hellboy (David Harbour) going to England to attempt to stop the return of Nimue (Milla Jovovich); a powerful sorceress known as the Blood Queen who cannot be killed, but who was cut to pieces by King Arthur, the pieces since hidden in enchanted boxes. When the Queen returns, it turns out that Hellboy is pivotal to her plans. It is worth noting that Guillermo Del Toro never got to finish telling his Hellboy stories. Hellboy II: The Golden Army, despite being inexpensive by the standards of superhero blockbusters, didn’t quite make enough to get its sequel greenlit, and so for eleven years we have had to leave the ending of that film’s fantastic Angel of Death scene frustratingly unresolved. Given that the story this film is based on appeared in the comics just months after Hellboy II’s release, it’s fair to assume that it could have formed the backbone of Del Toro’s third film. It’s notable how much Marshall seems to try to create that impression, employing similar ideas to the way that Hellboy is pulled between the world of humans and monsters in The Golden Army and positioning him in the same role the Angel of Death told us he would have. Despite this apparent fealty to some of the ideas developed in the previous films, at times this reboot also goes out of its way to distinguish itself from Del Toro’s work. It dumps the supporting characters of Abe Sapien and Liz Sherman and instead gives us new characters played by Sasha Lane and Daniel Dae Kim, both of whom give flatly disinterested performances. It’s not entirely their fault, neither character develops much of a personality and the dialogue is seldom more than functional. The effect of this is that the film loses the emotional investment the audience had in the story told in the previous films. This would matter less if 2019’s Hellboy truly felt like a standalone story, but I never shook the impression that this would have been a natural continuation of the previous series, so it always remained awkward. The odd mix of old and new is also at play in the overarching tone of the film. Marshall retains the humour of the previous films but it’s completely at odds with the extravagant CGI gore and the gratuitous swearing throughout. I’m not remotely prudish about language or violence, but neither feels like it’s coming from the characters so much as the fact Deadpool made a ton of money and a desire to show how ‘edgy’ this new take can be. The result is a tone that is wildly inconsistent, meaning that it never convinces in either its comedic or serious moments. It also doesn’t help that most of the film’s CGI, in contrast to the largely practical effects in the previous films, is awful. Del Toro’s films immersed us in a complete world; the practical effects made it feel physically real and helped paper over the few cracks in the CGI. The virtual creatures here look more rubbery than the ones actually made of rubber in Del Toro’s films. This is a particular issue when the emotional climax of the film is happening through a fully CG character, which is tough to take seriously when the effects look unfinished, with the actor’s face seemingly applied as a photoshop filter. As Hellboy, David Harbour does what he can. Vocally, he sticks close to what Ron Perlman did with the role and he does his best to force himself through the constrictive makeup (the one effect that, even if I’m not keen on the design, is well implemented), but the tonal issues come back to bite him as hard as they do every other aspect of the film. The problem is that neither the screenplay nor Harbour land the jokes and because the jokes are there, they help prevent the more serious material from landing. 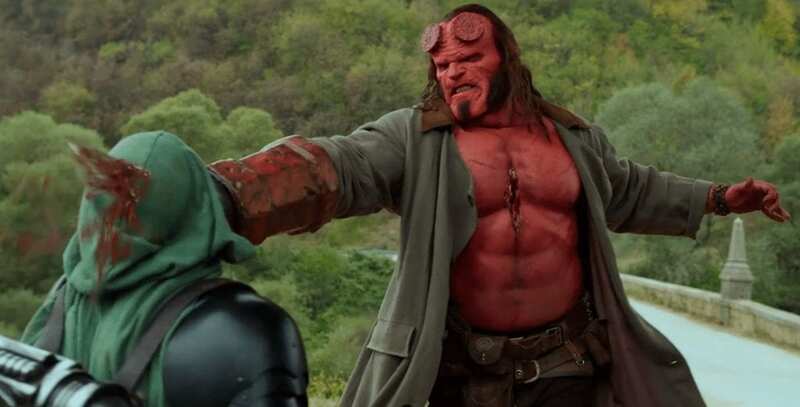 The idea of exploring Hellboy’s conflicted feelings about killing monsters isn’t a bad one, but it isn’t fully developed enough and if it’s supposed to play into the action scenes then that’s just another idea the film fails to stick the landing with. At least Harbour seems to be trying. That’s not so much the impression the rest of the film gives off. The supporting cast sleepwalk through their roles, Ian McShane especially looks as though he’s marking time until he can go to the Deadwood set. Even the ever-terrible Milla Jovovich, who could at least have had some fun chomping the scenery, doesn’t seem to be enjoying herself. There is a slapdash feeling to the whole enterprise. Everything feels tossed off; effects ninety percent finished, editing rushed, performances perfunctory and under-directed. There’s nothing appealing about this film, it mostly looks dingy and feels small, with many of the action scenes feeling bolted on rather than integral to the plot (a particular problem with the sequence of Hellboy fighting three giants). Part of this may be down to what was apparently a contentious production, with many disagreements between director Neil Marshall and the producers, but many films go through the same difficulties and emerge better than this disaster. On its own merits, Hellboy is a terrible film but it’s made all the worse by the fact it never shakes off the ghosts of the previous films, making me long for a version of this story that not only plugged me back into the visual richness of the world Guillermo Del Toro gave us, but into the emotional investment he established in those characters and their journey.